Let's get the basics set. 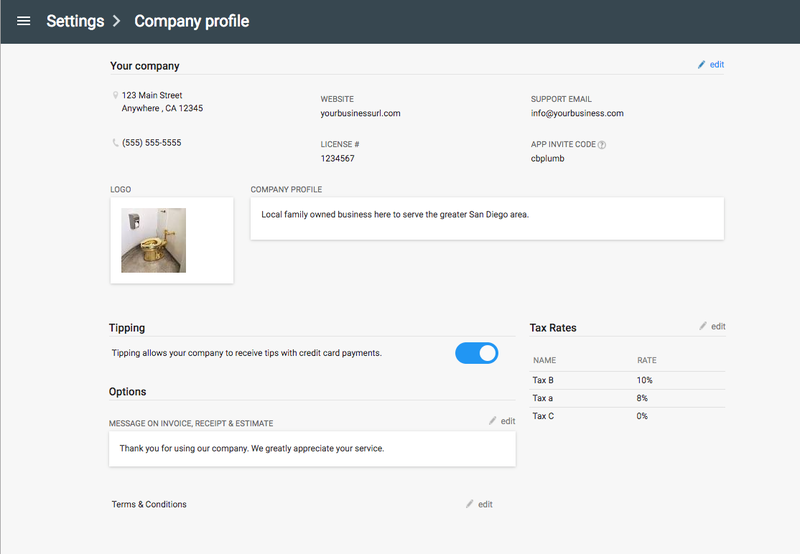 Your company profile is going to be where you enter your company info, set up your tax rates and set standard messages that will be seen on all documents. 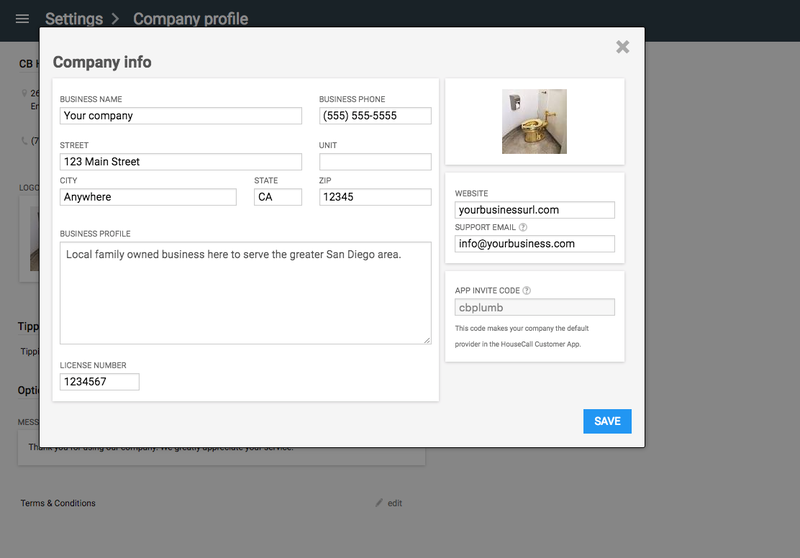 Fill out your company information. Your business name, phone number, address, website and support email can be seen on your invoices. Once you've filled out your information, hit SAVE. You can always come back and update this information later if it changes. If you set up your bank account to receive payouts (Step 6: Start accepting credit cards) you'll be able to receive tips from customers paying with cards. Just toggle on the switch! Set up your tax rates so you can select them to be automatically calculated and added to your invoices and estimates. If you're integrating with Quickbooks Online, you'll want to make sure these are set up to match EXACTLY how they are entered in QBO so that your invoices get automatically pushed over when you complete a job. Message on Invoice, Receipt and Estimate - Set up a message that shows up on the bottom of your invoice/estimate/receipt. You'll be able to customize individual messages later. This is just to get a standard message set up on your documents. Terms & Conditions - Put your disclaimers, legal information or warranty info here. Your T's & C's will show up as a clickable link on all electronic documents you send out and on the app in the field. Pretty easy right? Let's move on to add our employees. Step 2: Invite your Employees!